I can think of no better way to introduce you to Jewish Telechan than to tell you about Shtetl life. Telechan, in most ways, was a typical shtetl. Leo Rosten in The Joys of Yiddish and Hooray of Yiddish gives an excellent description of the shtetl. It sets the context of Eastern European Jewish life that was Telechan. "Shtetl - Little city, small town, village-in particular, the Jewish communities of Eastern Europe, where the remarkable culture of the Ashkenazim flourished before World War II. In many a shtetl, most of the inhabitants were Jews; in others, all were Jews. And it was in the shtetlach-that certain Jewish traditions and values were preserved and embellished until they achieved a character distinctly their own. The shtetl was the incubator and fortress of Ashkenazi culture .... the residents were poor folk, fundamentalist in faith, earthy, superstitious, stubbornly resisting secularism or change. They wrote in Hebrew or Yiddish, shunning foreign tongues among themselves. They were dairymen, draymen, cobblers, tailors, butchers, fishmongers, shopkeepers, peddlers. They considered their exile temporary and dreamed of the Messianic miracle that would --any day- return them, and their brethren around the world, to the shining glory of a restored Israel in the Holy Land. ...The Tsars had confined the Jews to the "Pale of Settlement," twenty-five provinces of the Russian empire. To live outside, a Jew needed special permission from the authorities-and some skilled workers, professional men and businessmen did receive (or purchase, via bribery) such permission. But the vast majority of the Jews in the tsarist empire lived within a restricted area. They could not move without approval from the police. Entire local populations could be abruptly "resettled," forced out of their homes, with no more legality then the arbitrary impulse of an often besotted governor. Jews were forbidden to own land. They were barred (with exceptions) from colleges and universities and from the humblest government jobs. They were not allowed to practice certain crafts, skills, and trades. Living in the shtetl was very hard. (... some years, thousands literally starved to death.) Jews were spat upon, beaten, killed, their synagogues and cemeteries desecrated - either in "minor incidents" shrugged off by the authorities, or in full-scale pogroms instigated by successive regimes. The hooliganism of drunken thugs, and the ghastly bloodbaths by pious Cossacks, were alike tolerated by government officials, witnessed by unprotesting Eastern Orthodox priests, openly abetted by the notoriously anti-Semitic police. In the shtetlach, the Jews produced their own people's culture, an independent style of life and thought, an original gallery of human types, fresh and rueful modes of humor, irony, lyricism, paradox-all unlike anything, I think, in history. There Yiddishkeit entered a golden age. The "Pale," established by Catherine II in 1791, ended, under severe economic and political pressures, during the first World War. The shtetl exists no more. Thousands of Jews left it for the factories of Odessa, Kiev, Warsaw, Lodz, Moscow, Petrograd-and from there went on, out of unholy Russia, anywhere; to Germany, England, South America, the United States. History will surely record the shtetl as a phenomenon worthy of remembrance. It was a world isolated from time, medieval in texture, living on the daily edge of fear. And it was a triumph of human endurance, a crucible from which flamed a brilliant and unexpected efflorescence of scholarship and literature”. The attitude of American Jews to the shtetl is torn by ambivalence. On the one hand [the shtetl] is remembered sentimentally ...it sends up a nostalgic glow for its survivors and for those who have received the tradition from parents and grandparents? 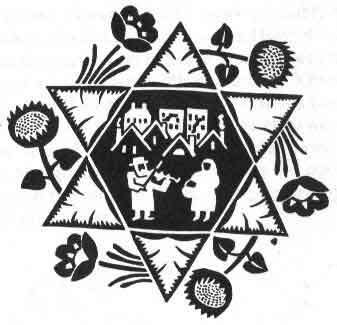 It is pictured as one of the rare and happy breathing spells of the Exile, the nearest thing to a home from home that the Jews have never known. On the other hand, it is recalled with a grimace of distaste. The Shtetlach! Those forlorn little settlements in a vast and hostile wilderness, isolated alike from Jewish and non-Jewish centers of civilization, their tenure precarious, their structure ramshackle, their spirit squalid. Who would want to live in one of them? The shtetl offers a pattern of the exalted & the ignominious."